Thank you to all hosts who completed the application for a grant. There has a been a huge positive response and so many fantastic projects were proposed. Because of the quality of the applications the number of grants awarded was increased from two to four. There were 86 applications in total. What level WWOOFers will be involved in the project. Greater involvement generally results in a more successful project and allows the WWOOFers to grow their knowledge and experience. What longer term benefits there will be for people visiting the project and what total duration the project would exist. Two grants were awarded for applications where there were benefits for organic development. Two grants were awarded for applications which had particular learning and educational benefits. We will post updates as the projects progress so please keep checking back here. If you are inspired by these projects then be sure to plan ahead for next year’s round of grants – we wish you the best of luck! Background Michael and Jocelyn have been developing Arohanui along permaculture principles for 6 years now. We have a 10 acre paradise that looks like unruly jungle to the untrained eye. Before moving on to the property there was no infrastructure (no driveway, water, power, dwelling or gardens), but there where lots of beautiful trees ranging from native bush, coppicing wood lot, fruit and nut trees and building timber trees. Inside the 6 years that we’ve been here we’ve been super busy turning clay into nutrient rich soil, planting gardens, building small dwellings from the clay under our feet. We’ve been learning about all the exciting skills that bountiful land encourages, such as baking bread in a clay oven, turning fruit into wine, raw milk into cheese, keeping bees organically, and how to build with poplar trees. Whilst being busy within the community earning what we need to pay the bills, we continue to chip away at various projects on the land which is becoming ever more bountiful year after year. We continue to learn every day. However, future plans are many! We hope in the next few years to upgrade our yurt space to a permitted, light earth, circular structure…. and much more! Description of the Project One of the areas of learning has been about what the best materials are (in this situation) for building garden bed walls. It started with organic coffee sacks filled with old coffee grinds (waste material from Michael’s old business), but they, eventually broke down. Next used off cuts of organic timber from the local timber mill (donated by the mill owner in exchange for some home brewed beer) were used, but eventually the buttercup takes roots in the cracks, which also host large families of snails. Finally the answer was found… reinforced cob! Mixing the clay with some aggregate, straw, and a little bit of cement for weather proofing these walls are proving to be aesthetically pleasing, great to kneel on when gardening, provide a nice space for sitting and enjoying the plants, keeping out the weeds, and of course eliminate hidy holes for snails. There is a large garden space and plan is to build all of the garden bed walls in this style. One of the benefits of this style of garden bed, not already mentioned, is that no toxic chemicals are required close to food source and soil. WWOOFer Involvement Earth building is the ideal wwoofer project. Not only are the skills simple and easy to pick up, but wwoofers expand their learning by asking them to teach others (ie neighbours, visitors etc). Their experience is that teaching others helps to deepen their own understanding. 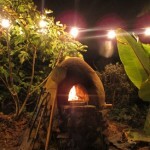 Learning to build with earth is a hugely tactile experience and one of empowerment. The aims is for visiting wwoofers to see their earth garden beds, or even dwellings one day! This is a project that wwoofers, once they pick up the basics, can continue at their own pace, even if it’s a day when we have to go to work, which is great for people who like to have a job they can work on independently, and mix it up with some other jobs, like gardening, to keep things varied.. Everybody can develop their own unique style and technique. Jocelyn and Michael like to remind wwoofers that their fingerprints will remain here in the clay for hundreds of years. When wwoofers get going, a wall can be completed relatively quickly, making this a project that lends itself to a sense of satisfaction. Due to the size of the gardens, and size of most of the projects, wwoofers are an essential aspect of their home and land, this project included. Long Term Benefits These garden walls will reduce water evaporation from the soil. This is essential as we are growing soil which we hope will help to feed future generations. These walls truly last the distance, and without nasty toxins! The knowledge shared in the process of this project we hope will inspire others to create and share knowledge with others. We won’t have to keep rebuilding garden bed walls! (just touch ups every few years no doubt). Background We are Beekeepers, we would like to teach more about bees, especially in the winter when we don’t have so many tasks to do. Our WWOOFers only get to do a limited amount of work on the bees due to different jobs in the seasons. Description of the Project Our project will be to obtain/build an observation hive, this way the bees can be studied or observed with minimal disruption. When our WWoofers arrive we can show them a fully working hive that they can look into and watch the bees doing their different jobs, the queen laying brood and also teach what varroa looks like. This knowledge is difficult when they are here for a short period of time so to have a hive that can be viewed at any time would be the best education we could give them. WWOOFer Involvement WWOOFers then get to see the brood box working and functioning as it should. When they have nothing to compare to on their own hives or want to learn so they can set up hives when they go home, unless they have a beekeeper willing to show them the job,it is hard to know how to get started and to keep bees alive. Our aim for WWOOFers is to get them to understand the integral part Bees have in world ecology and hopefully go home wanting to have their own bees. We have been fairly successful in inspiring WWOOFers to have a hive when they get home, I think we now have 4 that are now Beekeepers and 1 who is making a business with bees. Long Term Benefits We will make the hive transportable so that we can teach at the Farmers Market too. If the first hive goes well we could get WWOOFers to help make more so they can be used in schools. Background Part of organic farming is the humane treatment of animals. This includes things such as allowing them to live in an environment as close as possible to their natural habitat, including free ranging, natural remedies and organic feed. This project is on a a 12-acre farm outside of Whangarei, running sheep for meat, cows and goats for milk, and alpacas for fun. Also chickens (eggs), ducks (meat), bees (honey) and a big vegetable garden for the family. Recently experimenting with straw bale gardening to produce lots of veggies with no weeds. We make sure our WWOOFers get involved in interesting projects as well. Brewing ciders and fruit wines, make fresh mozzarella, chèvre and Camembert, and recently WWOOFers researched how to clean and purify beeswax to make their own candles. Description of the Project Build a free range enclosure. Raise a sow for meat. Cure prosciutto. Make sausages and pates. It’s difficult and costly to find top quality cured prosciutto, pates and all-meat sausages in New Zealand. This will also be a lesson in self-sustainability: We’ll feed the pig excess goat milk and plant a pig garden with lots of pumpkins and swedes. The plan is to raise this pig purely with calories from our farm; we hope we won’t need to buy any additional feed. WWOOFer Involvement WWOOFers will be involved at each stage of the process: building the pig pen and shelter, accumulating kitchen scraps, milk and meat for the pig’s daily feed, and (once the pig is butchered), building curing boxes for the prosciutto and rubbing salt on the pork each day. WWOOFers will also need to monitor the temperature and humidity of the pork so the meat doesn’t spoil. We’ve found that European WWOOFers are especially fascinated with learning how to make their own traditional delicacies by hand–though all our French visitors love cheese and wine, they’ve rarely made their own. This will be a chance for our WWOOFers to learn about prosciutto, sausage and pate from pig to plate! Long Term Benefits Once the shelter is built and had a successful season making cured meats and sausages, the aim is to continue raising pigs on an annual basis. The one-time investment in a sturdy shelter and enclosure will enable the raising of pigs for years to come. Background My husband Hermann and I live on a 6 acre property just outside Kinloch near Lake Taupo. Over the last 7 years we build our Straw-bale home, which also features living roofs, composting toilets and we make our own power from 12 solar panels, backed up by a generator. We are not on the ‘grid’. Sustainability is very important to us and we like the house to showcase various means of ‘green’ building methods that anyone can incorporate into their own home design. This set up is appealing to many Wwoofers and we spend many hours with them explaining and demonstrating the various aspects of a green home. The land got neglected during the building stage – which is now finished – and now that we have sold our organic wholefood café we can really get into the gardens. uses. EG. : kitchen herbs – medicinal herbs – herbs for tea – herbs for chickens – herbs for compost teas – digestive herbs – herbs to aid sleeping – and more. There is a ‘ballarina’ apple tree in the middle and I would like the beds to radiate out from the center like sunrays. A seating area, under a pine tree will give a place to rest and add personality. An edible hedgerow, on 3 sides, will add diversity and give shelter to beneficial insects, hedgehogs, birds; toads and such like. Clearing the site – probable the biggest job, requiring machines. Cleaning up this area will be the final piece completing ‘zone one’ of the permaculture plan developed for the property years ago. A comprehensive herb garden will be an important wedge – the complete pie being an educational center, showcasing resolutions to some of todays most pressing problems. We recently completed a classroom – with the help of WWoofers – which is going to be used for workshops from cooking to soil conditioning and from plant propagation to food forest design. I find it imperative that I can take my students outside to show what can be. I want to involve WWoofers in all aspects of this project from the initial planning to record keeping and even though we will eventually complete this project without help it would be done sooner, better and timelier with the assistance of WWoofers. Long Term Benefits The long term objective for this property is as a teaching facility. Completing this project would get us closer to our goal. We have already started teaching WWoofers and guests and would like to do more as the property evolves. The knowledge about herbs is very near to my heard and I have noticed good interest from all corners. A purpose build herb garden will ensure the success of this facility for years to come.